Questions for you all: Are you having trouble with my blog being slow to upload? If it is too slow and annoying, I was thinking of having my blog only show the first bit of each post on the front page, which means you'd have to click "continue reading" at the bottom of the post to see the whole thing. Would that be annoying for you? I want to make sure you all are happy and excited to read so any feedback you can give is greatly appreciated! This morning the hubb and I got up for another lovely morning run. I just love getting up and running in the morning, especially since it has been slightly warmer lately. The temperature has been around 40* when we wake up which is totally bearable, and running first thing gets me so energized for the day! We did a 2-mile ultra hilly route that I love because even though its short, I feel like I still get a killer workout in. The Charlottesville 10-Miler is one of the hilliest races in the country, so we have to be prepared for it! Morning Snack: My breakfast was yummy, but it definitely didn't stick with me as long as oats or an ezekiel muffin do...probably because I don't put nut butter in my cereal. 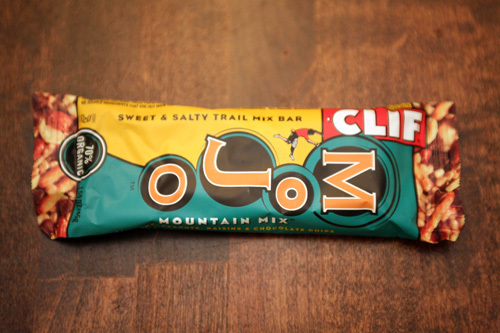 So at about 10:30 I broke into my Clif Mojo Mountain Mix bar and ate 1/2. This was my first time trying this flavor and it was really good, but I still prefer the Peanut Butter Pretzel flavor. 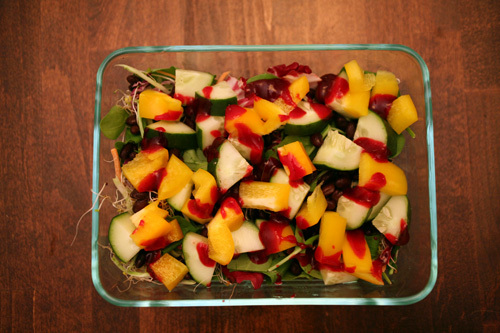 Lunch: I continued my CK love with a giant spinach salad topped with alfalfa sprouts, cucumber, yellow bell pepper, black beans, broccoli slaw and glops of cranberry ketchup for dressing. 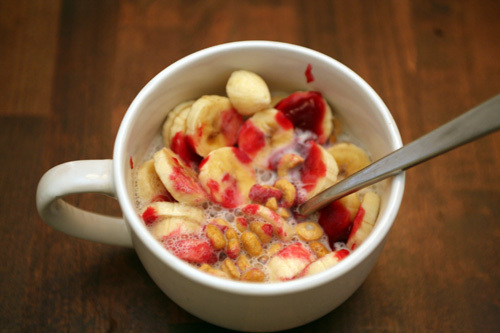 Again, YUM! Erin's right, it really is good on everything! 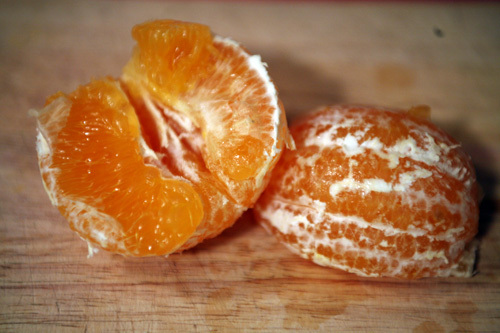 Afternoon Snack: The other 1/2 of my Clif Mojo and a glorious navel orange...it got me so excited to go to Florida! I want to come home with bags full of citrus! :-) After I ate my orange I realized how good the cranberry ketchup would be drizzled on it...next time! Evening Snack: Before dinner, while wrapping presents, I finished off a box of Annie's Honey Bunnies. They were gone so fast I didn't even have time for a picture...apparently I was starving. Dinner: Leftovers! Perfect for this busy night. 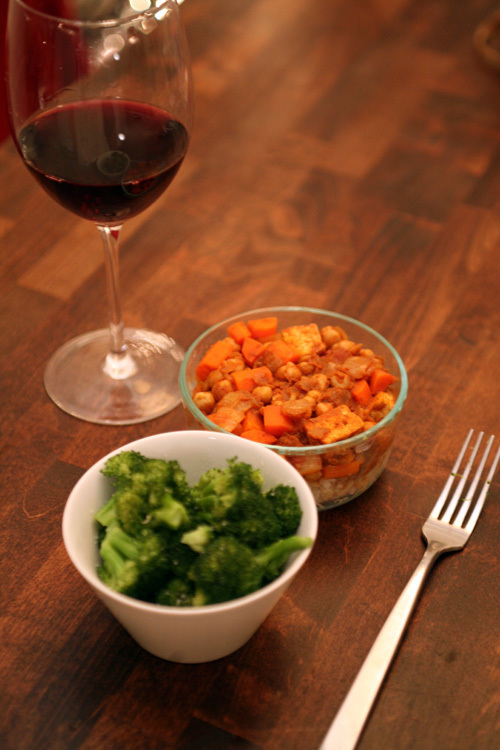 Veggie tofu korma with broccoli on the side. The korma was even better the second time around! And, a glass of Charles Shaw Coastal Syrah...so so good for only $4.99!!! I love Trader Joes!!! I have some more Christmas prep to finish...I can't believe how I've waited 'till the last minute this year! Not next year, I'm already planning our gifts for Xmas 2009. I loved hearing about what you all are making for Christmas presents this year! Its totally inspiring...I had planned to make a lot more gifts but time just got away from me. I have done a little knitting, a little baking, and the hubb and I made a couple of photo albums. Maybe next year we'll have an "all hand-made" or "all local" theme...that would be fun!